The family of Forbes of Newe and Edinglassie, which also possess a baronetcy, is descended from William Forbes of Dauch and Newe, younger son of Sir John Forbes, knight, who obtained a charter of the barony of Pitsligo and Kinnaldie, 10th October 1476, and whose elder son, Sir John Forbes, was the progenitor of Alexander Forbes, created Lord Forbes of Pitsligo, 24th June 1633, a title attainted in the person of Alexander, fourth lord, for his participation in the rebellion of 1745. John Forbes of Bellabeg, (Bombay Jock) the direct descendant of the said William of Dauch, as born at Bellabeg in September 1743. In early life he went to Bombay, and engaging in mercantile pursuits, became one of the most extensive and distinguished merchants in India. Having realised a large fortune he repurchased Newe, the estate of his ancestors, besides other lands in Strathdon, and the whole of his rental was laid out in improvements. He died 20th June 1821, and was succeeded by his nephew, Sir Charles Forbes, eldest son of the Rev. George Forbes of Lochell, by his wife, Katherine, only daughter of Gordon Stewart of Inverurie. He was created a baronet, 4th November 1823. He sat in parliament for upwards of twenty years. In 1833, he was served nearest male heir in general to Alexander, third Lord Pitsligo, by a jury at Aberdeen, and the same year he obtained the authority of the Lord Lyon to use the Pitsligo arms and supporters. He died 20th November 1849, and was succeeded by his grandson, Sir Charles, second baronet, born 15th July 1832, the title devolved on his uncle, Sir Charles Forbes, third baronet, born at Bombay 21st September 1803, and educated at Harrow school. Castle Newe The Vanishing Castle. Castle Newe was demolished in 1927. Yet it did survive for nearly a century, and for the greater part of the nineteenth century it was indisputably there, the nerve centre of a territorial empire that covered the entire upper strath of the Don, from Corgarff to Glenkindie, 30 miles of riverine loneliness, the kingdom of the men of Lonach, who march year by year at the end of August, with pipes and pikes and plaids under the banner of their patron. It is rather ironic that the Lonach Gathering with its picturesque trappings has lived on while Castle Newe died. This proves that a way of life can out last mere stone and lime, although both the castle and the clansmen’s march of the Lonach Highland and Friendly Society owed their existence to Sir Charles Forbes, the first Baronet of Newe. He in his turn inherited his broad lands from his uncle John Forbes of Newe, (or New at it was known then) familiarly dubbed, "Bombay Jock", the founder of the Indian merchant-banking firm of Forbes & Co Bombay. “Bombay Jock” was descended from a collateral line of the Forbes of Pitsligo who had built the old House of New in 1604. In addition to making a gift of £10,000 to build a lunatic asylum at Aberdeen, he entailed the estate of New and Bellabeg on his nephew Charles and bequeathed him funds for the specific purpose of enlarging the family home of 1604. Born two years before the last Jacobite rising in 1743, which dealt a deathblow to the ancient regime in Strathdon. “Bombay Jock” expended his Indian fortune in revitalising the upper Don. The transformation of the valley is depicted by the minister of Strathdon, who wrote in 1838, “of the vast improvement of the country by reclaiming and planting of waste lands, the draining and enclosure of fields, ….the opening up of the Strath by a turnpike road through the centre of the parish and the formation of good cross-roads with stone bridges over the different river crossings. Also the elegant and commodious residences of the proprietors and the comfortable slated dwelling houses and the substantial farm offices of the tenantry,” which he saw as a mark of he progress of civilisation. What “Bombay Jock” did for Strathdon at the end of the eighteenth century in fact provided the pattern for the Prince Consort was to do for upper Deeside 50 years later – and the parallels with Balmoral, with the Forbes demonstrating how it could be done a good half century in advance, are really quite striking. Charles Forbes had been working in the House of Forbes in Bombay until 1811. When he returned to this country he stood as MP for Beverley from 1812 to 1818 and for Malmesbury from 1818 to 1832. He was also elected rector of Marischal College in Aberdeen – a fact of significance when one remembers that Archibald Simpson, whom he chose to design Castle of Newe, also designed the new Marischal College in 1837. But this is to anticipate Charles actions. He increased his holdings in Strathdon by purchasing the estates of Skellater and Corgarff from the Forbes of Skellater and in 1823 he was created a Baronet of the United Kingdom. Strathdon at that time had a population of 1698; in 1979 it had fallen to 500. The establishment of the Lonach Highlanders was a direct sequel to the celebrations of the laird ‘s new honour and of his son John’s coming-of-age. The objects of the Lonach Society were “to preserve the Highland dress, and so far as possible the Celtic tongue and support loyal peaceable and manly conduct, and to promote social and benevolent feelings amongst the inhabitants of the district.” As a friendly society the men of Lonach also had their own superannuation and pensions scheme. One of the first acts was to build the Baronets Cairn on top of the 1892-foot Lonach hill, which forms the middle point of the Strath. At this time Archibald Simpson, at the age of 33 was achieving the first major success as the designer of the Assembly Rooms in Aberdeen and the Banking Rooms and Medical Hall in King Street. All built a Greek mode. He was however an accomplished country House architect. While a student in London he had been warned by S.P. Cockerel that architecture was a hopeless profession ‘without a connection or consequence”. So as early as 1811 he had obtained his first Country House commission from the Forbes family on Donside – designing a neo-baronial mansion to replace Putachie for James Ochoncar 18th Lord Forbes, the modern Castle Forbes near Keig on the left bank of the Don, and a neo classical wing for the medieval Forbes stronghold of Druminnor, near Rhynie. 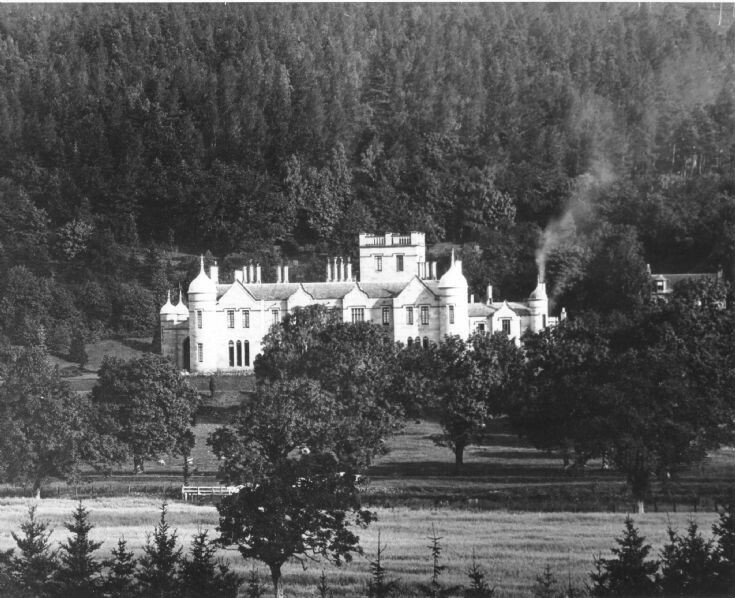 So it was not altogether surprising that Sir Charles Forbes, following the example of the chief of his clan, chose Simpson as the architect of Aberdeen first, “palace of the peak2, the new Castle of Newe on the southern slopes of the Ben. Eighteen miles west of Alford and 13cmiles from Dinnet on the Dee, the site was 898 feet above sea level fronted by a lawn sloping down to the river and backed by many fine trees, including ash, elm, sycamore, birch and rowan as well as numerous Scots pines. Eight years after the Castle was built the main road was diverted south to ensure Baronial privacy. To achieve this, two new bridges were built, Bridge of Buchaam at the east end of the Castle grounds and Bridge of Newe at the west. The ‘e’ was added to prevent letters meant for Sir Charles going to Newcastle-upon-Tyne and the form Castle Newe was adopted. Parallels with Balmoral Castle are inevitable. When Balmoral was built to designs by William Smith over two decades later, the Prince Consort also found it necessary to secure privacy by diverting the public road and building two new bridges over the river at Balmoral and Invercauld. Just as at Castle Newe, Balmoral faced the river with hills rising behind. It had a central tower 80 feet high as against Newe’s tower of 85 feet. At a distance Castle Newe and Balmoral look remarkably alike. But on closer look the resemblance fades. Balmoral is of white Invergelder granite and of Scots baronial design. Castle Newe is of reddish Kildrummy freestone and its mouldings are much more delicate and ethereal detail while the style is a sort of Jacobean baroque with charming curvilinear decorated window pediments with round towers and turrets bearing all those tall ogee helmets or pointed domes which are virtually a Simpson patent. In 1884 he gave warning that, however much against his inclination, it might be necessary to dispose parts of his inheritance in Strathdon. In 1900 there was a series of sales of estates, Delnadamph, went to J.J. Moubray , Candacraig to A. F. Wallace, and Deskry to Col Leith of Glenkindie. In 1908 Edinglassie was sold to H.J. Tenant and in 1911 part of Newe itself was sold to A.F. Wallace. The final blow came in 1924, when the Castle of Newe and the remaining lands were sold to Provost Donald Munro, Banchory, timber merchant and close friend of Sir Harry Lauder. What had been a magnificent stately home “lit by electric light” was scattered to all the airts. But something very special was saved from the ruins. The slabs and dressed stonework, sills, lintels corners etc” all of the finest Kildrummy freestone, were bought by the University of Aberdeen and used to build Elphinstone Hall at Kings College in Aberdeen – and the new creation was complete, in arcaded late Scots gothic style in time to celebrate the quincentenary of Bishop Elphinstone’s birth on 1931. Those were the days when a property owner could do exactly what he pleased with his own. But even in this conservation – proud era some of the very finest works of Archibald Simpson have been shabbily demolished. The New Market in Aberdeen, one of his grandest conceptions, much admired by the late John Betjeman, was sacrificed to a modern re-development. In 1973, the Music Hall, more properly the assembly rooms, menaced by a Town Council plan for a conference centre was only rescued after a public enquiry and the intervention of then Secretary of State for Scotland. At that time the Triple Kirks, still undeveloped, was threatened with as ‘reflective glass’ project. But the picture is not all black. Contemporary uses have been found for many of Simpson’s buildings. Grampian Region renovated and restored the Simpson’s buildings of the Gordons Schools Huntly, which bears some resemblance to Castle Newe, with a tall ogee helmet crowning its clock tower and window pediments, which also show curvilinear decoration. Like castle Newe, it is also of freestone. Meanwhile Aberdeen City District Council is to renovate the Music Hall in their original form. Castle Newe may not have died in vain. On the north bank of the river Don and added to the old mansion of the family in 1604 stands the stately castellated house, Castle Newe built in 1831 by Sir Chas Forbes Bart. The old house has been retained as part of the building and neither impairs the external appearance nor the internal convenience of the edifice. The architecture is highly appropriate to the situation and the circumstances of the house being in the simple and massive style of an old Scottish mansion, with many gable ends slender towers with pointed roofs and solid and substantial round towers at the corners. It is well adapted to the severe and grand surrounding scenery. To the north of the house rises the mountain Ben Newe and to the south is a lawn extending to the noble river Don. About four miles from Newe stands the old house of Edinglassie, which was for some time the abode of the family and which belonged to the maternal ancestors of the first Sir Charles, a very old family of the name of Stewart. Newe has been for centuries in the possession of the Forbes. William the first proprietor of that name was a younger brother of Alexander Forbes of Pitsligo, ancestor of the Lords Pitsligo. The house of Pitsligo is an early branch of the Lords Forbes and is now represented in the male line by Sir Charles Forbes. The family of Newe branched off about the year 1500 from that of Pitsligo, which became extinct in the direct male line on the death of the master of Pitsligo, the heir of the attainted Peer of that name in 1781. Then the branch of Newe became the sole male representative of the family while Sir William Forbes Bart of Monymusk became the heir in the female line, and assumed Pitsligo as his designation. The family of Forbes of Newe diverged into two branches. The last male heir of the elder branch was Major John Forbes of Newe who died without male issue in 1792. His only child was Lady Grant, mother of the present Baronet of Monymusk. On the death of Major Forbes the family of Newe was represented by his cousin the Rev George Forbes, and since his death in 1770 by his son Sir Charles. This gentleman in early life went to India, where his father's brother John Forbes had already laid the foundations of a great fortune, which he himself completed. He was a man of princely magnificence and his acts of liberality and charity as well in Bombay as in London will long be remembered with gratitude. A splendid colossal statue by Chantrey records the sense entertained of his benefits by the inhabitants of Bombay. Sir Charles succeeded to extensive estates in Aberdeenshire from his uncle. He was long a Member of Parliament and was created a Baronet in 1823. In 1833 he was served by a jury male heir of Alexander Lord Forbes of Pitsligo. His eldest son John one of the best most amiable of men and long an able distinguished director of the East India and member of Parliament, was removed from this world prematurely by in 1840, to the inexpressible sorrow of a circle of attached friends and sincerely regretted by all who had an opportunity appreciating his worth wisdom and benevolence. He was educated at Magdalen Oxford, and soon after he was of age became a Member of Parliament and being elected an East India Director applied himself to the business of that situation. In 1828 he married the of HL Hunter of Beech Hill in the co of Berks by whom he had among children an only son Charles who succeeded to the Baronetcy and family estates at death of his grandfather Sir Charles first Baronet in 1849. Sir Charles second Baronet died in Madeira in 1852 and was succeeded by his uncle Sir Charles the present and third Baronet late a captain in that distinguished corps the Lancers and heir male of the ancient of Pitsligo. Sir Charles is one of those Highland gentlemen who still promote and maintain the customs of the Gael. He assembles the clan Forbes by from their chief Lord Forbes and them to Braemar the headquarters of district in which they dwell, encamps during the gathering of the Duff, Forbes, Farquharson clans. His camp, complete all its details as to Highland arms and equipments, has been twice honoured by the of Her Majesty who upon the last occasion presented a banner to the Forbes clan. Castle Newe, from 1604, 1831, Archibald Simpson. Pronounced 'Neyouw. Handsome castellated edifice' with central tower 85ft high; demolished, c.1950, and stones used to build Elphinstone Hall at Aberdeen University. Castle Newe - a mansion built in 1831 incorporating an earlier structure built in 1604. (A L Hay 1887) According to Simpson (SDD 1960-), Castle Newe was a Z-plan castle with square towers similar to Glenbuchat (NJ31SE 4). Castle Newe was demolished in 1927. The original building was a plain T-shaped mansion with no defensive features, and was added to in 1791 and 1831. At NJ 3780 1227, part of a barrel-vaulted cellar and a corridor of the 17th century building remains, though in poor condition. A stone bearing the date '1604' is now mounted above the doorway of the house of Newe at NJ 3783 1231. Castle Newe was demolished in 1927, stones from the house being used in the building of Elphinstone Hall, University of Aberdeen. The large Jacobean mansion was built by Archibald Simpson in 1831. This earthhouse was discovered in 1863 beneath an apparent occupation area marked by a fireburnt pavement with ashes, beads and quern fragments. It was fairly complete, but had been robbed to build a garden wall which ran for about 50ft along its whole length. Its walls were 4 1/2ft high and corbelled, and the width of its paved floor was 7ft It was very similar to the earth-house at Buchaam (NJ31SE 8). 'A rounded flattish pebble of quartzite, probably a boiling stone, found in an underground house at Castle Newe'. All that can now be seen of this souterrain is the entrance, a dry-stone-lined rectangular pit, 1.6m N-S by 1.2m E-W and 0.8m deep situated in a dense wood and choked with undergrowth. A lintel stone at the base of the pit on the W marks the commencement of the passage which, though now impassable, is probably still intact. Simpson states that the armlets were made by a proto-Pictish tribe in the period A.D. 50-150. The British Museum accession no. is BM 1946.4-2.2. 3. terminals bent round through roughly 45 degrees (as indicated by hammering-marks) and re-annealed. Both the Drummond Castle armlets and one of the Castle Newe pair are inset with roundels containing yellow and red glass. The one surviving roundel in the Castle Newe armlets is constructed similarly to those from Drummond Castle but is retained against the inside surface of an opening on the terminal by three iron pins located in holes around the circumference. Notches cut into the edges of the armlets contain iron corrosion, possibly the remains of an iron strip which bridged the back of the settings. The colourants and opacifiers used were lead antimonate and cuprite in the yellow and red glass respectively. The Castle Newe armlets were found in the entrance of a souterrain and are held under accession numbers BM 1946, 4-2, 2 (no. 1) and BM 1946, 4-2, 1 (no. 2) respectively. Both measure 145mm in diameter and are of 'oval' form, each armlet being formed of three ribs, the outer two of which continue around the end to form ring terminals. No. 1 has ribs decorated with transverse lenticular ridges, the intervening spaces being filled by a pair of slender ridges separated to the width of the rib at each end but converging to touch in the middle. Between the main ribs there lies a pair of narrow 'cable-pattern' ridges. The inside bears a finish which suggests the moulding of a wax model. A circular medallion of red and yellow glass in a chequer pattern is set into the centre of one terminal while the glass itself is held in a frame of what appears to be sheet bronze with two concentric ribs. The surface is partly broken away revealing what appears to be a clay core while the frame and inset are held in position by a mass of dark material on the back, which overlies the edge of the circular hole containing the glass inset and its mounts. Slots at the top and bottom of the terminal probably indicate where securing wires were looped over the edges of the terminal. No. 2 is of the same design as no. 1 and doubtless formerly contained two similar glass insets in the terminals; these have now disappeared. Small holes drilled into the inner edges of the spaces of the terminals presumably held pegs or wire to secure mounts and medallions of similar form to those in no. 1. Two massive cast bronze armlets found several years before 1864 embedded in earth over the entrance to a souterrain in the grounds of Castle Newe, apparently with 'Ashes, parts of stone querns, beads etc. '; a denarius of Nerva was subsequently found nearby. Both armlets are in excellent condition and held in the British Museum under accession number BM 1946.4-2.2. 239. Armlet of Smith's 'oval' type retaining a red and yellow enamel plaque in one terminal aperture; it measures up to 11.5cm in internal diameter, 12.5cm wide at the terminals, and 8.9cm wide at the back. The supposed weight is 3.75lb. The main body is divided by two feather-incised channels into three long ribs; both these and the terminals are decorated in moderately high relief with patterns based on the lyre palmette and waving saltire motifs, employing for the purpose graded ribbons, trumpet domes and broken-back scrolls. The enamel detail is a simple chequerboard within an oval frame. The solid casting is of considerable technical merit, the feathered details having been executed after casting and the champleve enamel having been laid upon a sheet bronze disc and subsequently mounted on an iron panel of larger diameter before the entire complex was inserted from the underside and secured by a (?) iron crossbar. 240. Massive armlet, the pair to no. 239, and of broadly comparable design. Glass bead of class 13 (North Scottish spiral-decorated beads). This bead is held in the Banff Institution museum. The site of this souterrain is marked by a rectangular pit, measuring 1.7m from N to S by 1m transversely and up to 0.6m in depth. The pit is lined with dry-stone masonry, its N side possibly being part of the original wall of the souterrain. The E side is evidently of relatively recent date, as may be the other two sides. Accordingly, it is impossible to be certain which direction the souterrain extends or how big it is. The armlets and the glass bead are still in the British Museum and Banff Museum respectively, but the whereabouts of the quern and the Roman coin found in the 19th century are not known.